New Age meets the Old Religion when Nick Madrid is bothered, bewildered but not necessarily bewitched by pagans, satanists and assorted weirdos. Seances, sabbats, a horse ride from Hell and a kick-boxing zebra all come Nick's way as he obstinately tracks a treasure once in the possession of Aleister Crowley, the Great Beast: occultist, drug fiend and all-round bad egg. In this, my second novel, I wanted to take a traditional English village, Agatha Christie-type murder mystery, cross it with a horror/ghost story involving Satanism, add in a little New Age wackiness - and make the whole thing funny. I also wanted to set it nearer to home than my first novel, No Laughing Matter, which roamed from Montreal, to Edinburgh to Los Angeles. That's the great thing about books over film - you don't have to worry about the budget. The bad thing is that if you want to get your book filmed - and most writers do, whether they admit it or not - you gotta keep it simple. Hence, I admit, my decision to set Ghost of A Chance in Sussex and Brighton only. I live on the South Downs so researching locations came down to sitting in my back garden with a bottle of wine looking at the view. I live a few hundred yards away from an Elizabethan house where Aleister Crowley, the black magician and self proclaimed Beast of Revelations (whose number is 666) used to live. In the seventies a big rock star with an interest in black magic also lived there. So I got to thinking ... Also Brighton - the California of Britain in terms of weird ideas - provided rich comic material. I quickly found that however inventive I might be about comic situations or events, my inventions would pale beside things I heard about in real life. 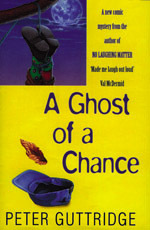 Take the kickboxing zebra who appears in A Ghost of A Chance. There's a (real) man in Brighton who, for reasons you and I can only guess at (unless you're he, in which case, hello), used to spend all his spare time as a zebra. He got a friend to paint his entire, naked body (and I do mean entire) in black and white stripes then he'd mooch around the town, well, being a zebra. His ambition was to get a herd of like-minded people (yeah, right), painted as zebras, up on the Downs, presumably for some kind of graze-athon. Well, as they say, you can't make this stuff up. So I created a fictional character who goes around as a zebra - but who is also a kickboxer. Yeah, well, I'd finished the bottle of wine by then. Good reading.